As a mother, I am always on the hunt for a delicious and preferably easy snack idea for my children, for when they get the munchies in between meals. Being mini meals, you want your children's snack to be nutritious but not so filling that it will put them off their next main meal. When convenience is not high on the priority list, these days I prefer to make my own snack food, as commercially available alternatives can often be packed with preservatives, salt, sugar and other nasties. Children are constantly on the go, and in order to grow and stay on top of their active lifestyles, they need fuel in the form of healthy calories. In addition to three well-balanced meals a day, your child will need nutritious snacks in between meals to see them through to the end of their day. If you happen to be the parent of teenagers, you may well find that your children eat continuously throughout the day, with hardly any distinction between snacks and meals! The below list includes a few of the snacks I've tried with (and had approved by) my children. As I am always being hounded for snacks, expect this list to grow! This is a childhood favourite of mine. My little ones love mango, and this is a real treat. 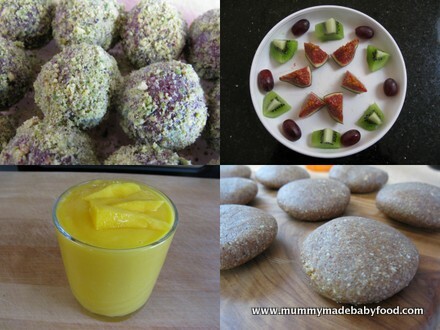 Full of energy for children on-the-go, these beat the commercially prepared versions. Pure, unadulterated fruit does an amazing job at keeping hunger at bay in between meals. As good as the real thing but completely guilt-free! A figgy snack that's not just for the holidays. Tastes just like a ginger biscuit, only healthier. Perfect for under-one's and teething babies, these cool treats contain no added sweeteners. A deliciously moreish yet healthy treat, perfect for those hot summer days.